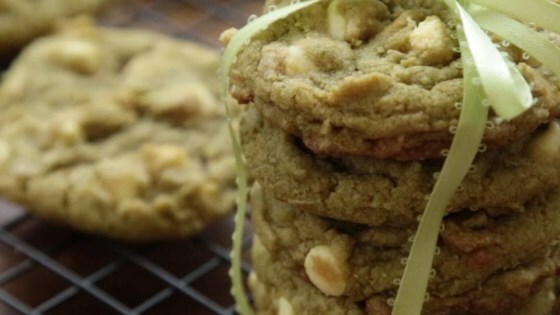 "Fun twist to the original chocolate chip cookie." Preheat oven to 325 degrees F (165 degrees C). Grease baking sheets or line with parchment paper. Sift flour, matcha, baking soda, and salt together in a bowl. Beat brown sugar, butter, and white sugar together in a large bowl using an electric mixer until blended; beat in vanilla extract, egg, and egg yolk until light and creamy. Mix flour mixture into creamed butter mixture until dough is just blended; fold in chocolate chips using a wooden spoon. Drop cookie dough, 1 heaping tablespoon per cookie, onto the prepared baking sheet 2 to 3 inches apart. Bake in the preheated oven until edges are lightly browned, 8 to 10 minutes. Cool cookies on the baking sheet for 2 to 3 minutes before transferring to a wire rack to cool completely. I made these, the cookies came out great.